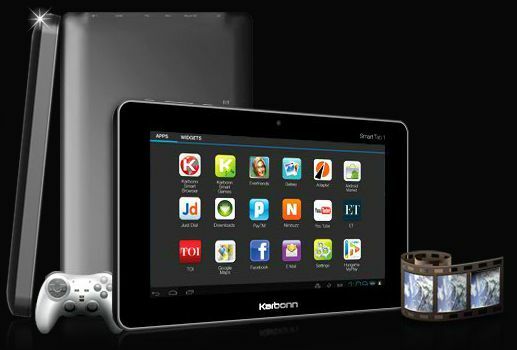 Karbonn soon to launch its Android ICS tablet in Indian market called Smart Tab 1. Karbonn Smart Tab 1 has 17.8 cm Capacitive 5 Point Multi Touch Screen, 1.2 GHz Processor, 2 Mega Pixel Front Camera, 3D G-Sensor for Gaming Experience and it runs on Android v4.0.3 Ice Cream Sandwich. Smart Tab 1 comes with Wi-Fi and HDMI support. Unfortunately 3G is available through external USB Dongle only as we seen in many tablets in same price range. 3700 mAh Battery powers the Smart Tab 1 which gives 7 Hours of Internet Surfing Time, 8 Hours of Video Playback Time on Earphones and 25 Hours of Music Playback Time on Earphones. The Karbonn Smart Tab 1 is available with the price tag of Rs. 6990 and the prebooking is already up on Karbonnmobile site. It seems the competition getting tougher in Tablet market specially in low cost tablets. What do you think about this tab?